Google Chrome users must be aware of the popular T-Rex Runner game that was introduced back in September 2014 with Chrome Canary and is now a part of all Chrome builds. The cute T-Rex dinosaur game integrated into Chrome browser comes into action when you’re not connected to the Internet and the web page shows “You are offline”. The game starts and the T-Rex aka dino suddenly starts jumping when you press the spacebar on a computer or tap the T-Rex on a touchscreen phone. The endless gameplay involves jumping the little dino over cacti and save it from birds in order to survive and play further. However, the game ceases when you’re reconnected and the page reloads. Available both on the desktop and mobile platform, this classic genre game comes off as a good stress buster. 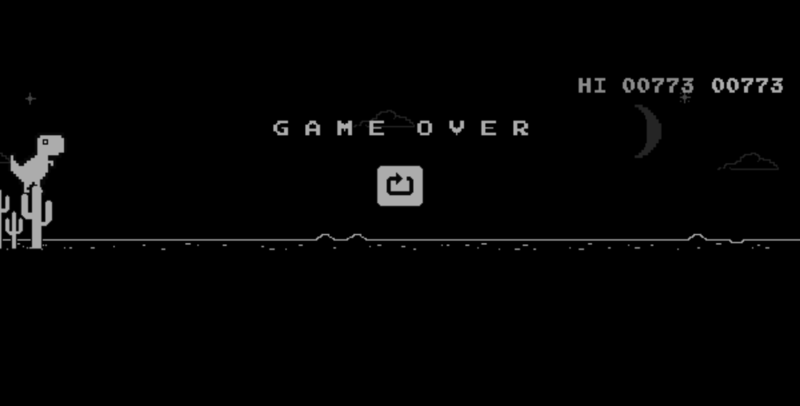 Well, until now the only gripe was that the dinosaur game on Google Chrome could be only played while you’re online, hence users who loved playing it regardless of the Internet connectivity couldn’t do so. Thankfully, Uri Shaked, a Google developer expert for web and cloud technologies has introduced a new hack that allows users to play this fun game even when they’re online and connected to the Internet. To play Dinosaur game in Chrome while being online, simply type “about:dino” or “chrome:dino” in Chrome’s address bar and you’re good to go! Wow! That\’s smart. I thought it was only possible when you don\’t have any active internet connection only. If I had to play this dinosaur game, I intentionally disconnected internet while reloading a page in my smartphone but this is a neat trick which I am gonna use now. Wow! Very helpful information I love your article and also your writing skill. Thanks for sharing these type of helpful information.